Travel back in time to rule the Roman Empire alongside the honorable and formidable Caesar. Click here to play! You'll find yourself amongst the ancient Romans, watching gladiators battle for their lives in the Coliseum. Or try to stave off the seductive powers of Cleopatra as she works her works her charm on Caesar. You'll need to seek the guidance of Caesar if you want to succeed in this empire. He appears on reels 1, 2, 3 and 4. If you spin four Caesar icons you'll win 2500 times your original line wager. He'll also double your winnings when he appears on any other winning combination. Collect five Cleopatras and you'll be rewarded with 2500 times your original wager. Other symbols reminiscent of the Roman times will reward you with a generous treasure trove full of cash. Watch out for Roman helmets, shields and swords. 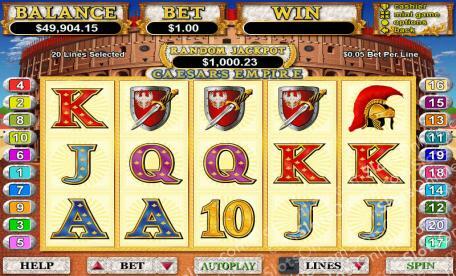 If you can manage one or more Caesars plus a Coliseum on reel 5, you'll trigger a bonus feature that awards free games. Take a seat next to Caesar and oversee the goings on of Ancient Rome. If you're lucky, you might just win a bundle of cash while you're helping to rule one of the biggest empires in history. Two to five Coliseums anywhere on the board will multiply your total bet respectively. A bonus feature is activated when you get at least one golden Caesar coin plus a Coliseum icon on reel 5. This feature awards the player with up to 15 free games. During the free games, all Coliseum symbols are changed to Caesar or Cleopatra symbols to help you maximize your winnings. Every Caesar that appears will reward you with up to five more free games. The honorable Caesar appears on a golden coin that acts as a substitute icon. This icon will replace any other icon to create a winning combination. It triples the prize when it appears in a winning combination. Spin four of them and you'll win 2500 times your original line bet.